We all know by now that movie remakes seldom work out so hot and yet film makers – especially in recent years, it seems – keep going back to the same well again and again. Where remakes work best is when a particular story/concept isn't just re-hashed but rather when it is “re-booted” with some sort of fresh spin on the original concept. The BATMAN/DARK KNIGHT trilogy comes to mind as a good example of this and, more recent and more directly related to this article, 2014's GODZILLA is another. That's what the producers of KONG: SKULL ISLAND did. They took the basic concept of Kong and his mysterious, uncharted island … then threw away the old plot with the movie crew and the golden-haired “beauty” who ultimately leads Kong to his demise from atop the Empire State Building and re-booted all that with a whole new set of characters, an updated time period (mid-1970s), and a whole new reason for going to Skull Island, complete with a military helicopter squadron escorting them. The motives for the expedition get to be a little complicated and silly (but, hey, this is a giant-prehistoric-monsters-in-modern-times movie so it's not fair to look for hard scientific reasoning) and, of course, there's more to 'em than everybody is at first led to believe. Upon reaching the island, the team's transport ship cannot land because of the fierce “perpetual storm” that surrounds and obscures the place. So they go in via the military helicopters which are able to penetrate the storm. Once through, they immediately begin dropping explosives from which the accompanying seismologists can test one of the theories (a hollow earth) that brought them there. What they get instead is a pissed-off Kong who doesn't like uninvited guests showing up and setting off bombs in his back yard. To show his annoyance, he attacks the copters, destroys them all, killing many, and splitting the surviving members of the expedition into two groups. From there, the movie becomes a long chase sequence with the two groups trying to reach a rendezvous with a re-supply team due to arrive at a point on the north end of the island in three days. Along the way, they have several clashes with various prehistoric monsters still in existence on the island – most fearsome of all being the underground reptilian horrors known as the Skullcrawlers. Kong, it turns out, is the island's protector against these predators and other threats. I enjoyed this movie a lot. I was really looking forward to it, and did not come away disappointed. The ensemble cast plays well off one another, particularly the banter amongst the soldiers. The male/female leads struck some subdued romantic sparks, though nothing overt came of it. 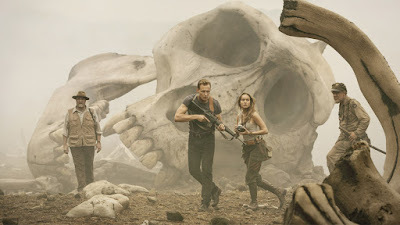 Brie Larsen made an impression as a spunky, somewhat sassy big-time photographer who looked quite fetching in a very tight tank top; Tom Hiddleson, as a former British Special Air Service captain hired as tracker-hunter isn't really given a lot to do as the lead in an action movie, but conveys a certain presence and adequately handles what is asked of him. Samuel Jackson, as the commander of the helicopter squadron, intently portrays a man seeking revenge for the men he lost on the island and also revenge for having to “abandon” the Vietnam war. John C. Reilly, as a WWII pilot stranded on the island for all these years, nearly steals the movie (from the live-action performers, that is) by providing equal measures of humor and grim, sage advice for the newcomers. The special effects are excellent and, when they are on display, there were two things I really appreciated about them: One, they were filmed in such a way where you could actually follow the action that was taking place (as opposed to, say, the TRANSFORMERS movies, where the screen is just a blur of colors and motion and you have no idea who the hell is doing what to who); and Two, director Jordan Vogt-Roberts has a keen sense of how long to let these action set pieces play (as opposed to , say, Peter Jackson who, in his 2005 KING KONG remake, let some of his action scenes go on and on and on, until they were squeezed dry of all excitement and actually became boring). All in all, a terrific popcorn-action-fun movie to kick off the summer movie-going season. 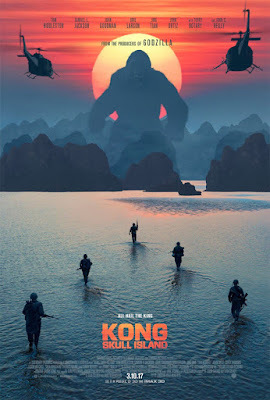 And, perhaps best of all, Kong is left alive at the end (I don't think this is too much of a spoiler because the fact has been widely mentioned) to be appearing again a couple years down the road when he's scheduled to duke it out with another heavyweight contender from the past … Godzilla! Great review, Wayne. You had me at Brie Larson in a tank top. I'm going to see it tomorrow. Like you said, Wayne--great popcorn movie! Huddleston seemed like an odd leading man choice to me, but I loved John C. Reilly. Like you said, he stole the show. Through the entire thing, though, I kept thinking, "Man, this director really loved Apocalypse Now!" It's also like an homage with an ape and other monsters thrown in. I gave it a C. Great action sequences, but there were two instances of incredible stupidity that exist only to bend the plot in a certain directions. Brie Larson was a wow, though. Author of the Joe Hannibal PI series, Westerns, and sometimes other genres.Retired fromthe real world. Widower (alas my beloved Pam left me in February of 2008). Now devoting full time to writing.